Khyongla Rato Rinpoche's good friend and student, the great photographer Clive Arrowsmith is offering profits from the sale of his posters and greeting cards on ETSY.com. Click on the link below to see and purchase his work. All profits from the sale of these posters go to The Tibet Center. ~ THANK YOU CLIVE !! SIMON HOULTON of the Institute of Buddhist Dialectics Dharamsala will give two lectures at TTC / KTL to discuss Rime non-sectarian approach to studies and practice. Artist reception for the documentary film "MONK WITH A CAMERA"
On Saturday December 6th, Venerable Khen Rinpoche Nicholas Vreeland was a guest on Scott Simon's "Saturday Weekend Edition" - 6 to10AM PST, on KCRW 89.9 to discuss the documentary - Monk With A Camera. 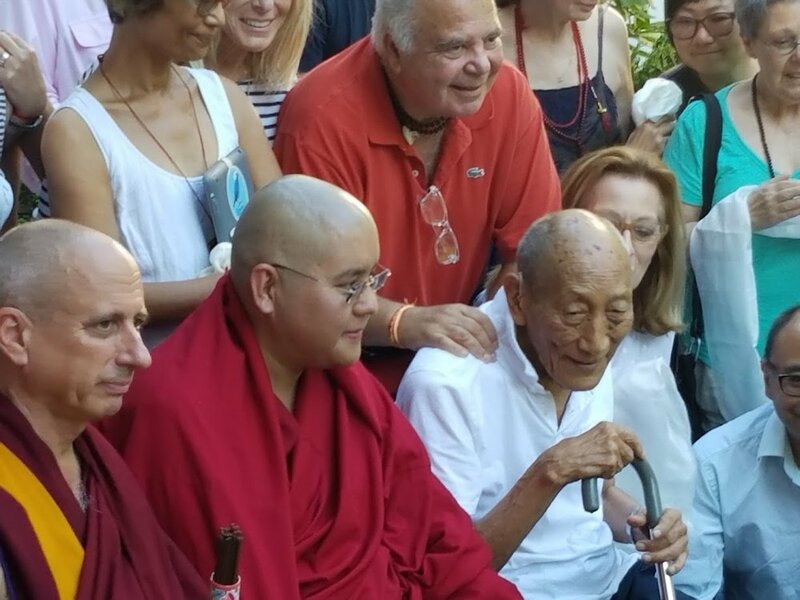 Congratulations to Venerable Khen Rinpoche on receiving an honorary degree from The American University of Paris ! Since 1984, it has been a tradition at The American University of Paris to award honorary degrees as a way of recognizing a distinguished person’s contributions to a specific field, or to society in general. An honorary degree is very often awarded to distinguished individuals whose accomplishments are consistent with the mission and core values of AUP. May 26 - 18:00 -20:00 in the Grand Salon at 31 avenue Bosquet. 2014 Honorary Degree Recipient Nicholas Vreeland '73 will join the AUP community to share insight into his life as abbott of the Rato Monastery. ...and.has been invited to the Ashland Film Festival April 3rd through the 7th 2014! the film will play on THURSDAY, April 3, at 1:20PM at the Fletcher Theatre (in Durham) - Producer /Director Tina Mascara will be attending. Minneapolis, Washington DC, Taipei and New Zeland screenings to be announced soon. LIKE us on FB at Monk With A Camera or FOLLOW us on Twitter @monkwithacamera. The documentary chronicles the life and spiritual quest of our Khen Rinpoche Nicholas (Nicky) Vreeland, grandson of legendary Vogue editorDiana Vreeland, celebrated artist, and now a Tibetan Buddhist monk. The Tibet Center was extremely saddened upon receiving the news that on February 26th 2014 our beautiful friend Alessandra M. Bini PhD had passed away. Alessandra was a devoted buddhist practitioner, esteemed scientist scholar and the nicest heart you could ever meet. We will miss her very very much. The Tibet Center will say prayers for Dr. Bini this Monday March 3rd, 2014. She is survived by her son Matteo Lorenzet. We will post information regarding funeral or memorial services as details are made available to us. Dr. Alessandra M. Bini was the Program Director in the Diversity Training Branch within the Center to Reduce Cancer Health Disparities (CRCHD) at the National Cancer Institute (NCI). In this role, she oversaw funding mechanisms such as the Ruth L Kirschstein National Research Service Award Predoctoral Fellowship (F31) and the National Research Service Award Institutional Training Grants (T32) Supplements. In addition, she was involved in trans-NCI and trans-NIH activities. From 2006 – 2010, Dr. Bini served as the Scientific Review Officer (SRO) for the Nuclear Dynamics and Transport (NDT) Study Section and for the Cell Biology and Development (F05) and Technology Development (F14) Fellowship Study Sections at the Center for Scientific Review (NIH/CSR). Earlier, she served as SRO in the review offices of the National Institute on Aging (NIA) and the National Heart, Lung and Blood Institute (NHLBI). Prior to joining NIH in 2001, Dr. Bini was Associate Laboratory Member at the Lindsley F. Kimball Research Institute of the New York Blood Center (NYBC). Her research focused on the interaction of the matrix metalloproteinases system with the fibrinolytic system relevant in thrombosis, atherosclerosis, angiogenesis, and inflammation. She participated in the scientific review process for agencies such as the American Institute for Biological Sciences (AIBS, US Army) and the Department of Veterans Affairs Merit Review Boards. Dr. Bini received her Ph.D. in Pathobiology and Molecular Medicine from Columbia University in New York for work on the role of thrombosis in the progression of human atherosclerosis. Previously, she obtained a Dr. Biol. Sci. degree from the University of Milano, Italy and trained and specialized in Pharmacology in the Thrombosis Laboratory at Mario Negri Institute, Milano, which pioneered new studies on the interaction between thrombosis and cancer and in the Thrombosis and Vascular Biology Center at the University of Leuven (Belgium). As part of her Dr. Biol. Sci. degree she studied behavioral-cognitive psychology and received further training in counseling at the Italian Association for Demographic Education. Dr. Bini was Head of the Coagulation and Fibrinolysis Research Unit at Consorzio Mario Negri Sud, Italy and a Visiting Scientist at the New York Blood Center. November 24, 2013, "Monk With A Camera" will have its World Premiere at IDFA, the International Documentary Film Festival in Amsterdam! The documentary chronicles the life and spiritual quest of our Khen Rinpoche Nicholas (Nicky) Vreeland, grandson of legendary Vogue editor Diana Vreeland, celebrated artist, and now a Tibetan Buddhist monk. The Tibet Center is happy to announce the purchase of a new retreat home in South Orange, NJ in late October 2013. The Tibet Center will still be based and hold weekly classes in New York City, NY. The retreat home will perform separate and additional functions such as the hosting of teachers, seminars, meditations and retreats. We will have an inaugural White Tara meditation this Saturday - November 9th at 1:30pm. There will be a lunch reception after the meditation in celebration of its opening. Those interested in attending please send an email to Darren Smith @ dsmith@thetibetcenter.org. The Tibet Center Retreat Home - 502 Ridgewood Road North, South Orange, NJ 07079. You can take NJ Transit from NY Penn Station to Mountain Station, South Orange, NJ. You then walk West on Montrose Ave approximately 1/4 mile to the corner of Montrose and Ridgewood Road. We are located on that corner to the right. His Holiness the Dalai Lama's teachings at the Beacon Theatre 2013 on LiveStream. We have just learned from His Holiness that he will start Fridays' October 18th teachings at 9am instead of the scheduled 9:30am time slot.